Time and again, writer Daniel Alarcón has found himself on those lists that make other, less fortunate writers gnash their teeth. He's been named one of 37 under the age of 36, 39 under 39, and 20 under 40. Alarcón is 40 now — he was born in Peru, grew up in the suburbs of Birmingham, Ala., and he's got a new collection of short stories called The King is Always Above the People. He very rarely mentions where the stories are happening, whether city or country. "It happened with my first collection where somebody wrote me and said, you know, 'You're writing a lot about Lima but ... it sounds like you could be writing about Lahore,' Alarcón says. "And I feel like there are certain things that are happening in cities across the world that are universal." It refers to an image that surprised me the first time I saw it because the words kind of don't conform at first blush to the image itself, which is of a head of state hanging from a gallows, and a crowd below looking up at his corpse. In this case, it just struck me that there was something mysterious in that phrase and there was something — an idea about patriarchy and about authority that a character had to grapple with. Well, the story's really about a young man who moves to the capital, sort of in search of his dreams, and his dreams include getting out of town, going to the big city, seeing the world, and he's in some ways leaving this kind of stultifying, small town where he was raised and his parents, his father in particular, had lived in the city previously — just long enough to make enough money to go back home, and in that year that his father had lived in the city, he'd been witness to a revolution, which had not excited him in the least. His father had been, you know, very conservative, and when this young man makes it to a city, he's living near the port, working at a store near the port, and they happened to sell these postcards that have this image. In the story, it's a photograph of the dictator being hanged, and the young man, the protagonist of the story, thinks a lot about how this image would shock his father, and it almost has this kind of out-sized power because of that. You know, one of the writers I really admire is Mario Bellatin. He lives in Mexico City, and many years ago, I was talking with him about how our current situation in the United States had felt to me so, so reminiscent of the divisions and the polarization that preceded the Civil War. But it seemed to me that the time was right for some kind of historical mashup, and I just wanted to play with this idea of Lincoln as this totemic figure, and sort of bring him to life in a way that was deliberately weird. I think I end up pretty much the same person most of the day ... but I'm really drawn to reinvention as an idea. I think about my own parents, who moved to the United States in 1980 and the bravery and the courage in something like that. My mom always says ... 'Dani, like, didn't we give you a nice childhood?' I mean, my stories are sometimes not, you know, things don't end well, but you know, no one wants to read about things that end well. Come on, let's be honest. It just seems utterly boring to me. I mean, because the truth is, things don't end well, and if things end well in a story it's only because they'd lopped off the last four chapters, you know? But hopefully as you read and follow these people on those trajectories, you're entertained, or you learn something, or you discover something about yourself that feels true. This story was produced for the radio by Samantha Balaban and Martha Wexler, and adapted for the Web by Sydnee Monday and Petra Mayer. Time and again, writer Daniel Alarcon has found himself on those lists that make other, less fortunate writers gnash their teeth. He's been named one of 37 under the age of 36, 39 under 39, and 20 under 40. Alarcon is 40 now. He was born in Peru, grew up in the suburbs of Birmingham, Ala.
And his latest work of fiction is out next week. 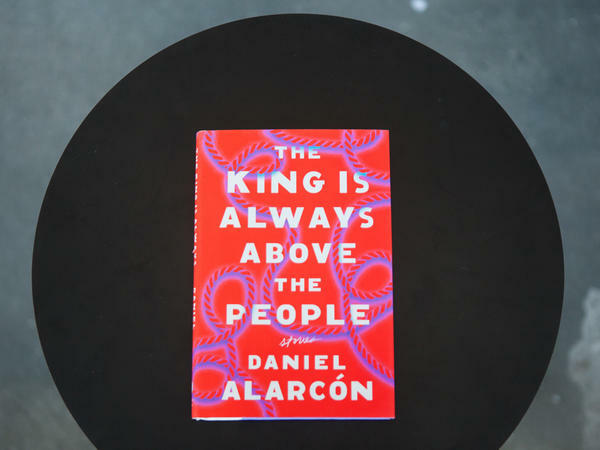 It's a collection of short stories called "The King Is Always Above The People." Daniel Alarcon joins me now from New York. Welcome to the program. BLOCK: And let's talk about the title story - the notion of the king being above the people. In a sense, in your story, that's meant ironically, right? ALARCON: Yeah, it refers to an image that surprised me the first time I saw it because the words kind of don't conform at first blush to the image itself, which is of a head of state hanging from a gallows and a crowd below looking up at his corpse. In this case, it just struck me that there was something mysterious in that phrase, and there was something - an idea about patriarchy and about authority that a character had to grapple with. BLOCK: And the image of a dictator being hanged, swaying above a crowd of people - it does make its way into the story in a very small way, right? Why don't you explain how it filters in? ALARCON: Yeah, well, the story's really about a young man who moves to the capital sort of in search of his dreams, and his dreams include getting out of town, going to the big city, seeing the world. And he's, in some ways, leaving this kind of stultifying small town where he was raised. And his parents - his father in particular - had lived in the city previously, just long enough to make enough money to go back home. And in that year that his father lived in the city, he'd been witness to a revolution, which had not excited him in the least. His father had been, you know, very conservative. And when this young man makes it to the city, he's living near the port, working at a store near the port. And they happen to sell these postcards that have this image. In the story, it's a photograph of the dictator being hanged. And the young man - the protagonist of the story - thinks a lot about how this image would shock his father, and it almost has this kind of outsized power because of that. BLOCK: It seems that in most of these stories - I think all but one - you never actually name the city or the country where they're taking place. Why is that? Are you trying for something universal? ALARCON: I think there is something universal happening. You know, it happened with my first collection, where somebody wrote me and said, you know, you're writing a lot about Lima. But then this person was from Lahore, you know, and they were saying, you know, it sounds like you could be writing about Lahore. And I feel like there are certain things that are happening in cities across the world that are universal. I mean, as an artist, as a writer, I don't want to be tethered to reality. I do - you know, do journalism also. But in this particular part of my life, I want to interpret events through the prism of imagination. ALARCON: I also like to mash up countries and make things a little weirder than they sometimes appear to be. BLOCK: And mash up time in a really interesting way. I want to talk to you about your story "Abraham Lincoln Has Been Shot" because there's a moment where it takes this really wild turn. So it starts out in the present day. There are two guys sitting in a bar. They've just been fired from their work at a call center, and they're discussing Abraham Lincoln. And then all of a sudden, there's this line - Lincoln and I had met at a party in Chicago - long before he was president - at one of those Wicker Park affairs with fixed-gear bikes locked out front. ALARCON: (Laughter) Yeah, you know, one of the writers I really admire is Mario Bellatin. He lives in Mexico City. And many years ago, I was talking with him about how our current situation in the United States had felt to me so reminiscent of the divisions and the polarization that preceded the Civil War. But it seemed to me that the time was ripe for some kind of historical mashup. And I just wanted to play with this idea of Lincoln as this totemic figure and sort of bring him to life in a way that was deliberately weird. BLOCK: Yeah. There's a moment where the narrator talks about combing out Lincoln's beard for him - and that Lincoln loved it - that he would purr like a cat. ALARCON: (Laughter) Yeah, because it's a love story between the narrator and Lincoln. And this kind of, like, you know, years later when Lincoln is assassinated - there's this moment of kind of nostalgia for the past and for a relationship, you know, that - what could have been, you know, between these two men who were in love. And it seemed to me just - you know, how can I write a tender moment between this fallen hipster on the brink of a civil war and the future head of state? BLOCK: These characters in your stories are often taking on new identities. They're escaping prior lives. There's one who's trying to become a different person after he gets out of prison. There's a boy who basically turns himself into a beggar, a son who takes on the identity of his older brother. Is that something that you feel in your own life - that you're sort of trying on different identities, as well, and stepping into different roles? ALARCON: I think if I were braver, yeah. I think I end up being pretty much the same person most of the day. Maybe when I play soccer, I'm slightly more aggressive than the rest of my life. ALARCON: But I'm really drawn to reinvention as an idea. I think about my own parents, who moved to the United States in 1980, and the bravery - the courage in something like that. You know, just like, oh, I'm going to go start over. I'm going to go reinvent myself in a new language. And I've also seen people, you know, living in New York. You know, people come to New York, and they they're like, you know what? Now I'm going to be the person I always wanted to be. BLOCK: Although I have to say that in these stories, that reinvention does not generally work out for the best. BLOCK: These are not uplifting - you know, I've turned my life around and found a new me kind of stories. ALARCON: Well, you know, my mom always says - you know, she's like, you know, Dani (ph), like, didn't we give you a nice childhood? ALARCON: I mean, my stories are sometimes not - you know, things don't end well. But, you know, no one wants to read about things that end well. Come on. Let's be honest. It just seems utterly boring to me. I mean, because the truth is things don't end well. And if things end well in a story, it's only because they lopped off the last four chapters, you know? ALARCON: But, hopefully, as you read and follow these people on those trajectories, you're entertained, or you learn something, or you discover something about yourself that feels true. BLOCK: That's Daniel Alarcon. His new collection of short stories is titled "The King Is Always Above The People." And he's host of the podcast Radio Ambulante, distributed by NPR. Daniel, thanks very much. (SOUNDBITE OF THE ECHELON EFFECT'S "SIGNALS") Transcript provided by NPR, Copyright NPR.